Tradition is an inspiring source for fashion designers. But after the inspiration, comes the challenge of reinterpretation -- redesigning the past in a current context. Hanbok, traditional Korean clothing, is no longer worn every day by most people. Though praised for the beauty of its color and silhouette, many feel it uncomfortable and impractical. Reinterpretation is necessary to revive the clothing into modern wear. But it is not easy to find the right balance between the old and new while creating aesthetic values at the same time. Here are two designers -- Lee In-joo ㅈand Lee Seo-jung -- who have redesigned the past into the present in their own ways, inspired by hanbok-related elements. The name Moon Lee became widely known when K-pop star Son Na-eun of Apink demonstrated the dance movements for her band’s new song on MBC talk show “Radio Star,” wearing a skirt with numerous deep slits. The slits swayed as Son danced, creating a romantic swirl of blue and white. The skirt was from local brand Moon Lee, led by Lee In-joo. Though Lee just become a widely recognized name, the brand has been well-known among fashion industry insiders for its artistic touches. The designer uses fabric like a canvas, drawing and painting on the clothes. “My mother’s family name is Moon and my father’s family name is Lee. So I put them together, making Moon Lee,” Lee told The Korea Herald at the brand’s studio in central Seoul. “My mother is a hanbok designer and he is a sculptor. Growing up, I was always surrounded by art. I thought everyone grew up like me, walking down hallways of paintings at home,” she said. Lee initially named her brand Moon Lee Artwear, showing her love for art and aim to display an artistic taste in her collections. But now, it’s just Moon Lee, as she thought the extra word created a barrier, limiting its potential customer base. Nevertheless, the artistic influence in her works helped her graduate top of the class at London College of Fashion. Her collections have an overarching theme of art therapy, as the designer hopes to heal people’s scars and wounds with her clothes. For instance, the theme of Moon Lee’s 2017 fall-winter collection was “healing.” For Lee, the issues of Brexit, the election of US President Donald Trump and Korea’s own presidential scandal and ousting came as a shock. Thinking that people could be emotionally hurt from the issues, she showcased outfits designed with the idea of art therapy. Lee used bright, vivid colors often used for art therapy. Some of the graphics used for the clothes were also inspired by the candlelight vigils in Korea. “People are psychologically healed through paintings and artworks. It’s the same for fashion. I hope people can be healed through wearing my clothes,” she said. Lee’s mother and her whole family are in the hanbok business. Thanks to that background, the designer has learned to appreciate the beauty of traditional clothing, not just the silhouettes and fabric, but also the decorations. More than just appreciation, she adapted the elements in her collections, requesting skilled artisans embroider her clothes. “They are amazing artisans, but many are thinking of retiring as hanbok business is slow. It would be such a shame for the legacy to come to an end. I will do what I can to help the industry,” she said. First lady Kim Jung-sook is an advocate of hanbok, as her parents ran a hanbok fabric shop. She wears hanbok or hanbok-inspired clothing on official occasions to help recently struggling industry. It’s not an everyday event for a first lady to walk into a designer’s showroom. But for Lee Seo-jung, it has happened. First lady Kim has worn the designer’s clothes on multiple occasions while abroad. “I was greatly thankful. Also, I was happy as my parents were proud of me. It was proof that I have done something right,” she told The Korea Herald at her private showroom in central Seoul. Her showroom was filled with hues of white, gray and black, resembling an ink-and-wash painting. The displayed clothes were imbued with heritage, greatly influenced by styles of hanbok. Lee, who originally studied architecture, switched to fashion in the last years of college. 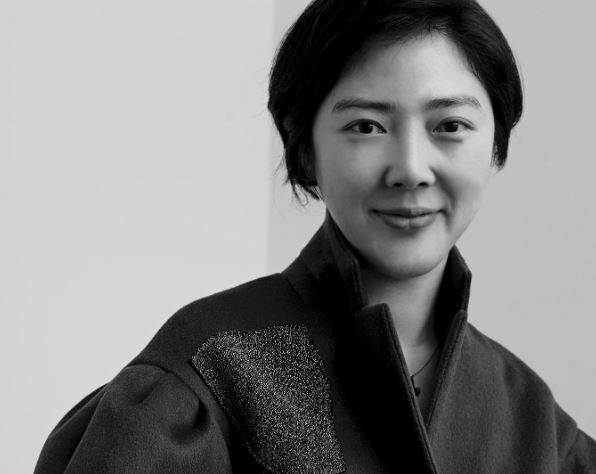 She went on to study at the Fashion Institute of Technology in New York, where her classmates found the Korean influence inherent in her designs. To properly apply hanbok elements to her fashion, she took hanbok-making classes when she returned home during summer breaks. There is no end to learning hanbok, she said, adding she still takes lessons occasionally to learn from the masters. Air and movement are the two keywords that describe C-ZANN E.
Lee considers the two elements the most important. When designing, she imagine how the pieces would be like when the wearer walks, when the wind blows. To create the air-filled movements, Lee uses fabrics made by local artisans, sometimes making special requests to produce a specific type of fabric. 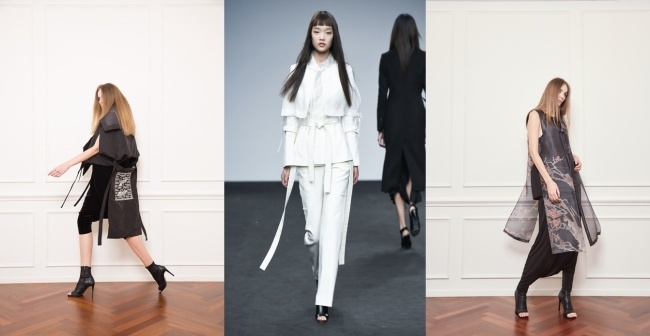 Though the fabrics are usually used to make hanbok, Lee creates modern wear with them. C-ZANN E is sold at the brand’s showroom and pop-up shops at local department stores. “Through the pop-up stores, I meet new customers. They learn about the brand at the stores and then visits the showroom later to make purchase,” the designer said. “Usually women who are attending international events contact me, saying that they want something that can show Korea’s beauty, like someone who emcees a global conference or CEOs who are meeting global buyers,” Lee said.